Ogres stand between 8 and 9 feet tall. Their skin is a dull yellow, covered with patches of hair, scars, blotches, even pustules. Some ogres are quite obese, but many are lean. Ogres develop a hunched over posture due to their great height and as such walk stooped, it is a rare ogre that stands straight. Almost all ogres have black hair that is worn long, the less civilized ogres leave it uncombed and unclean. Ogres were a combination of leather and animal hides, cloaked with thick furs for those in the mountainous regions or arctic areas like the Icereach. Love of jewelry and other body ornamentation is common throughout all ogres regardless of class standing or wealth. Ritual scarring and piecings are common and extremely prevalent in the clerical and magi ogres. … there are some, especially in larger ogre communities, who are quite intellectual. These will generally be leaders, clergy and magi. 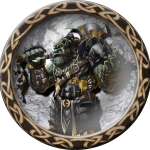 Many ogres have a racial hatred of humans ever since the uprising which took their human slaves from them, and tore their great empire asunder.